It is almost time to say goodbye to 2014 and welcome 2015. This is a great holiday for many humans, but what's fun for us can be terrifying for cats, dogs, and other pets. Here are some of our best tips to keep everyone safe during the holiday. Don't underestimate a pet's ability to flee from perceived danger. If fireworks or firecrackers scare your dog, they have an uncanny ability to get out and seek a "safer" place. Keep your pet inside, in a room where they can't get out or hurt themselves. Make sure your pets can't bolt out of the front door if people come and go. Your yard might be secure enough for your pets on the other days of the year, but when it comes to fireworks they get astonishing abilities to climb fences. If your cat or dog seeks out their safe place in a crate or even under the bed, leave them be. Extreme behavior from humans - even if it's intended to calm the pet - can reinforce their sense of danger. Keep a radio or TV on as background sound to cover some of the noise from the outside. Check that your pet's tags and microchip information is up to date. This will increase your chance of getting him or her back if they get out anyway. Find a video of fireworks and play it on low volume a few times during the day. Give your dog treats, play, and cuddle while the video is playing. The purpose of this is to associate the sound with something positive. Increase the volume slowly. Keep doing fun things every time you play it. If your dog shows fear at any time, turn the volume back down. Keep the positive reinforcement of treats and play coming. Desensitizing doesn't always make the fear go away. When it's time for the actual fireworks, try to drown out the sound and allow your pet to hide if he or she wants to. Some dogs have severe firework anxiety. Discuss with your veterinarian to see if anti-anxiety medication is right for your furry friend. That's a good point. :-) Here in Florida it's a many-day thing. 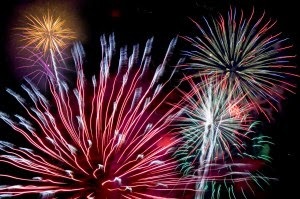 Are you afraid of fireworks, or do you do well with the loud noise?